the 1st of February belongs to Brigid… – every day's a holiday! 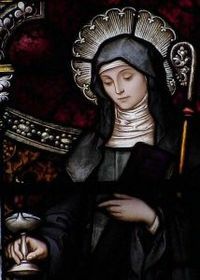 The Catholic church has been at odds with Brigid’s legacy for most of its existence. The bishops of Ireland found the goddess’s pagan following to be too deeply embedded in local tradition to be stomped out. Even the newly-converted Irish Christians refused to stop worshipping their exalted patroness. The Church decreed, If you can’t win ’em, join ’em. Brigid became Saint Brigid. In the other the she became the daughter of a Druid father ( and in some stories of a Christian mother from Portugal kidnapped by pirates!) and was named after the Celtic goddess. She lived from 451 to 525. She was known for her generosity as a young woman, and devoted herself to God, deflecting proposal after proposal from eligible suitors. She was baptized by St. Patrick himself and became a devout nun and Abbess, eventually founding the Abbey at Kildare in the 5th century. In the Celtic tradition the Abbey at Kildare is believed to have preceded the so-called Saint herself. It was an ancient shrine to the Goddess before Christianity ever reached the Emerald Isle. There priestesses kept alight an eternal flame at the shrine until the 1220s when a Bishop, angered by the Abbess’s ‘no men allowed’ policy and the Druidic rituals, ordered the sacred flame to be put out. The last insult to Brigid was her expulsion from the list of Saints in the 1960s. During Vatican II she was decanonized due to insufficient proof of her existence, after volumes of creative embellishment written about the supposed nun’s life and deeds over the centuries. Brigid is affiliated with wisdom, healing, metal-work or craftmanship, flames and fire, and childbirth, even though she was a virgin in the Christian tradition. Likewise Imbolc is the transformation of winter into spring. Note how Knowles reverses the carry-over from Brigid’s pre-Christian goddesship. In the British Isles Brigid’s Feast and Imbolc merged with Candlemas. Both involves the ancient druidic lighting ceremony and purification rites, originally meant to honor Brigid. Some calendars list February 1 as Imbolc, others February 2. Most likely the celebration began on the evening of February 1 and concluded the following day, as was the tradition of the time. Bless candles that you will be using for rituals throughout the year. 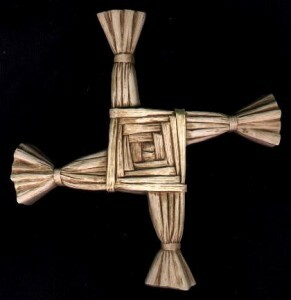 Invoke Brigid for creative inspiration. On Imbolc 1993 the Brigidine Sisters of Ireland relit the Kildare flame.